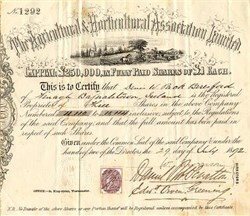 Beautiful certificate from the Agricultural & Horticultural Association Limited issued in 1872. This historic document has a vignette of a farmer plowing a field. This item has the signatures of the Company's Director's and is over 136 years old.